Gladys of the Yarn Floozies is holding a raffle of some pretty amazing yarn (Wollmeise, anyone?) to support her husband’s Ride2Survive cancer fundraising bicycle ride this summer. For your chance to win (and to support a great cause), enter by 8 pm PST, April 26. Wendy’s giving away a copy of One Ball Knits: Purses. Leave a comment by 4 pm EDT, April 16, for your chance to win. Have you been following the #amazonfail kerfluffle at all? Whoops. Speaking of online reputation, Lifehacker has some info on how to monitor your own. I’m particularly interested in this topic because I wrote my Master’s thesis (Rhetoric) about online ethos (that is, your character and credibility online). Squee! LMAO. Here’s one for the Linux geeks. Hmm – I think you should get very, very nervous at this point. I don’t think we’re ready for the Knitputer yet, do you? Unless it’s like this way to calculate set-in sleeves, that is. If you’re a garage/yard sale junkie, the Yard Sale Treasure Map should streamline your plan of attack. Just when you’ve given up on the future of humanity, there’s a story like this. I recommend that you print this out before beginning your time travel journey. Posted by Chris on Tuesday, April 14th, 2009, at 3:00 am, and filed under Contests, Linkity linkity link. OMG What have you done to the kitties!?! I’ll never get to sleep again! Lol! That second pic is like the “friendly Terminator” because it looks like she’s smiling. 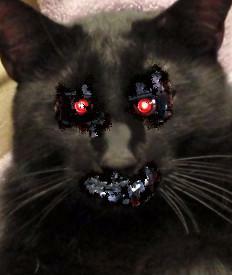 Terminator cats are scary!! I saw the first photo before I managed to read the line, eek! Thanks for the yard sales map link; I’m going to try it for estate sales (tho I’m not sure they’re listed on Craigslist? ), as I always forget to check the newspaper. Nightmares no. But loosing breakfast yes! OK, that Terminator thing scared the crap out of me. 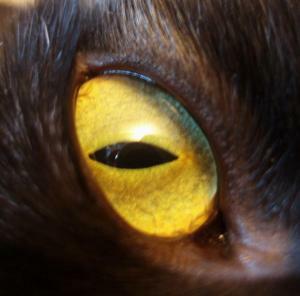 But I love the black cat links and the info on the Amazon happenings! Chris- I just like the Linux Penguin. They are Borg kitties, and they are scaring me. Put those kitties back the way they are supposed to be. Right now. I’m serious. I love the Terminator! I need that cheat sheet. Maybe I’ll put it in my blackberry just in case. For some reason, that second photo reminds me of a demented Panda bear. One of my friends told me about the amazon thing yesterday and I don’t think I would have noticed otherwise. Some days I feel like I am living under a rock. I will never be able to sleep tonight. Oh, man! Those are creepy!! I hadn’t heard anything about Amazon. Thanks for the link to the article. There’s an interesting discussion in the comments, as well. I think Chaos would be all for Terminator status if it would make you scared enough to provide him with a constant tuna supply. Knitting peeps may be scarier than terminator kittehs. Gawd! That first picture scared the crap out of me! I’m not kidding. Yikes! I considered trying it with my horse, but… that could make it too hard to deal with him next time he blows a mental gasket. In the third shot in the video of the robot in Washington Square, the one where there is a planter with yellow flowers slightly right of center screen and in the far distance you can see a tiny bit of blue sky in the upper right corner? The building just to the left of that blue sky is Goddard Hall, the residence hall where Older Son lived during his freshman year at NYU, 2003-2004. 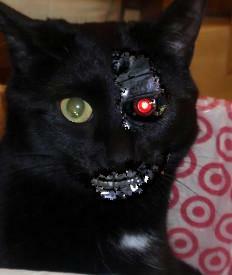 Oh no poor kitties turned into Terminator kitties! I’m not scared of no kitties! I’m actually a little bit scared of the Amazon story…. Well, I was going to comment on today’s post, but it seems comments are off . . . Thanks for your comment on the contest you linked today. I think that’s more likely to give me nightmares than either the Terminator Kittehs or the picture of the critter in the tub . . .
What a cool topic for a Masters Thesis – I’ll bet that it really rocked.